As expected, the diesel engine manufacturers did not stagnate during this period but rather met the challenges of the marketplace with new technological improvements. They have made the diesel engine a mechanical engineering marvel capable of satisfying the needs of the deepsea owners as well as the inland waterway operators. They have made this inherently efficient engine available in such a wide range of power, size, and weights that an appropriate engine is available for nearly all marine applications. One casualty of the very high efficiency of super-long-stroke engines is a relatively low amount of usable heat in the exhaust gases. The very efficient expansion of the cylinder gases results in low exhaust gas temperature, which in turn results in low exhaust gas energy availability thereby reducing the amount and/or conditions of the waste heat produced steam. Manufacturers of four stroke cycle, medium/and high-speed engines have concentrated on improving engine volumetric efficienty and air-fuel mixing as the primary means of improving engine efficiency. Design improvements of modern marine diesel engines go beyond thermodynamic cycle advances and into the realm of engine maintenance. The use of hydraulic devices for pre-tensioning of bolts, studs, and tie-rods, as well as custom rigging devices for easy handling of heavy components, are commonplace. Advanced designs of cylinder heads to include valve cages, which simplifies valve maintenance, are commonplace on four stroke cycle engines and two stroke cycle engines using uniflow scavenging, especially on those en- gines designed to burn the lower quality fuels. The responsibility for a well operating diesel vessel does not rest solely with the engine manufacturer but must be shared with the ship designer, the onboard operators, and the ashore support effort. The design marine engineer responsible for the systems design must pay close attention to the vessel's intended operating mode and expected available fuel. On board systems should be engineered with sufficient margins to allow for service growth as well as the expected and unexpected that the future holds in store. One system in particular that design marine engineers should be liberal in defining system specifications is the fuel oil conditioning system. Equipment selected should not be expected to operate at the extremity of its operating range at design power. A liberal equipment selection policy might be slightly more expensive initially but most likely will result in lower life-cycle costs for the vessel. What follows is a synopsis of the technological activities and accomplishments of many diesel engine manufacturers addressing the challenges they face in designing marine diesel engines that will help usher in the 21st century. B&W ALPHA Circle 71 on Reader Service Card B&W Alpha Diesel A/S of Frederikshavn, Denmark, is a company of the M.A.N.-B&W Group that designs, manufactures, markets, and services complete vessel propulsion systems. Last year the company completed the integration of the in-line and V version of the 20/27 M.A.N.-B&W diesel engine and the in-line version of the 32/36 M.A.N.-B&W engine with existing Alpha controllable-pitch propellers and gearboxes. This has resulted in four-cycle diesel propulsion systems developing as little as 680 bhp at 1,000 rpm, which can burn heavy fuel oil up to 2,100 sec. Redwood 1 at 100 F.
In addition to diesel engines, Holeby production includes major components such as crankshafts and connecting rods for use by licensees in the manufacture of 4- stroke B&W engines, as well as spare parts for its own engines. The company also manufactures fuel oil mixing units and other auxiliary equipment. BERGEN DIESEL Circle 58 on Reader Service Card Reducing fuel expenses, which are representing an ever-increasing part of a ship's total operating cost, has always been one of Bergen Diesel's main endeavors. Generally, there are two ways to achieve that: (1) building engines that have the lowest possible specific fuel consumption and the ability to burn low-grade heavy fuels; (2) developing engine systems for ship propulsion and power generation that allow engine operation near the engine's and the system's point of optimum efficiency. CATERPILLAR Circle 57 on Reader Service Card Caterpillar 3500 Series marine engines have set new standards for fuel savings—savings that can actually allow repower with full payback in less than IV2 years. Fuel savings may in fact exceed 35 percent at all operating loads, not just within a limited range or at "rated" load. Designed for tighter oil control than two-cycle engines and most four-cycle engines, the 3500s can save several thousand dollars a year in lube oil costs alone. For simplified maintenance, front-mounted governor and sidemounted oil, water, and fuel transfer pumps improve accessibility. Fuel filters, oil, and oil filters can all be changed at the same time. Access covers near the camshaft and in the crankcase allows simple and effective visual inspection. These and other 3500 Series design features translate into less maintenance time and lower maintenance costs. COLT INDUSTRIES Circle 56 on Reader Service Card Colt Industries' Fairbanks Morse Engine Division continues to offer both the Colt Pielstick and the Fairbanks Morse opposed-piston diesel engines. The Fairbanks 38D8-1/8 opposed-piston engine is offered in both blower-scavenged and turbocharged versions, with horsepower ranges from 708 to 3,500 bhp at 750 rpm, and 920 to 4,200 bhp at 900 rpm. These engines have always enjoyed high fuel efficiency, but today's sophisticated electronic control and monitoring systems are squeezing even better fuel economy from them. Fairbanks Morse continues to produce the Colt Pielstick PC-2.3V and PC-2.5V diesel engines, with ratings from 6,420 to 11,700 bhp at 520 rpm. These engines are capable of burning heavier grades of residual fuels. The Engine Division now offers the Colt Pielstick PC-2.6 L & V and the high-horsepower PC-4.2V diesel engines. The PC-2.6, with horsepower ratings from 4,422 to 13,266 bhp, is a development of the PC-2 series medium-speed engine with the same general dimensions. The PC-2.6 engine can burn all heavy fuels available on the market. The engine is fitted with water-cooled cages and exhaust valves, especially adapted to the fuel's vanadium content. The advanced technology of the PC-2.6 engine enables it to burn the poorest foreseeable heavy fuel without major modifications. The Colt Pielstick PC-4.2V, rated from 16,270 to 29,286 bhp, is able to burn residual fuels of up to 4,000 sec. Redwood #1 at 100 F with a 400 ppm vanadium content. The Colt Pielstick engines are backed by SEMT Pielstick's ongoing research and development programs. The PC engine family has approximately 60 million hours of experience running on heavy fuels. COMBUSTION ENGINEERING Circle 55 on Reader Service Card Combustion Engineering, Inc. is a leading supplier of steam generating equipment for the marine industry, both military and commercial. CE has designed and manufactured main propulsion, auxiliary, and waste heat boilers for more than 40 years. In addition to new product design and manufacture, CE offers after-market support including service and OEM parts. While marine steam generators have always been capable of burning degraded fuels, many shipowners are looking for alternative fuels to reduce their operating costs. CE has been actively involved in the development of modern, coal-fired marine boilers, with four ships presently in service and two more scheduled for delivery in 1984. 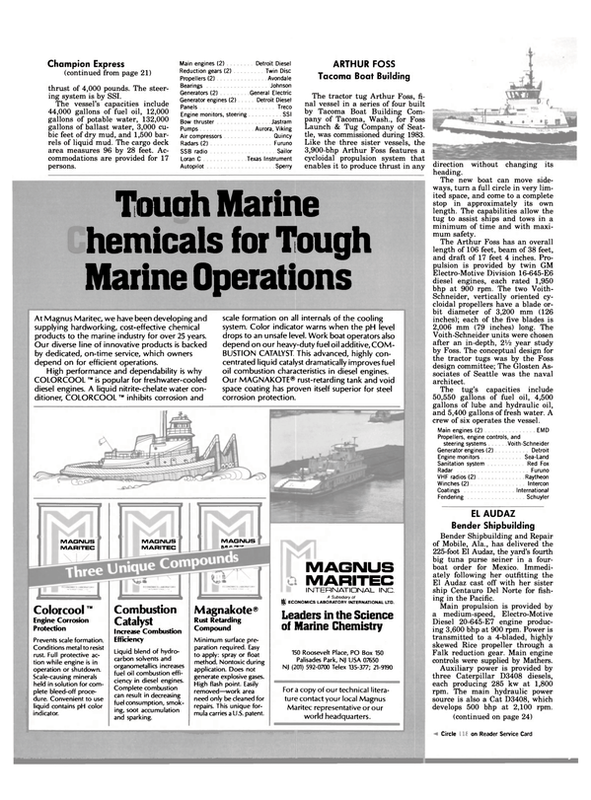 As another alternative, some shipowners are interested in burning PETCOM (petroleum coke/oil slurry). Hereto, Combustion Engineering has been at the forefront of this new technology, performing atomization and combustion tests for marine boilers. RELIABLE POWER - RELIABLE SHIP CUMMINS ENGINE Circle 54 on Reader Service Card Cummins Engine Company manufactures six series of marine diesel engines rated from 170 to 1,250 bhp, continuous-duty operation. Designed for heavy-duty workboat and fishboat applications, both main propulsion and ship service auxiliary power, Cummins engines have developed a reputation over the years for fuel-efficient power. The KTA-3067-M engine is rated at 1,250 bhp at 1,800 rpm for continuous- duty applications. It is a 16-cylinder engine with 3,067-cubic- inch (50.3-liter) displacement. Recognized at their introduction as the most fuel-efficient marine diesel engines in their horsepower range, the K series engines have been improved continually to reduce specific fuel consumption. DAIHATSU DIESEL Circle 53 on Reader Service Card With its extensive experience in the marine field, Daihatsu has developed a new type of engine, the DL series, which features low quality fuel burning, low load operability, and low fuel consumption. Since the DL series was placed on the market, Daihatsu reports an increasing number of orders from many overseas shipowners. EFFICIENCY SYSTEMS Circle 52 on Reader Service Card Efficiency Systems Inc., a subsidiary of Flowtron Industries, Inc., had developed and is marketing Fuel Log, a line of low-cost fuel management systems that enable operators to reduce fuel consumption by about 10-15 percent. The heart of the energy-conserving unit is the slow-flow liquid meter manufactured by Transamerica Delaval Inc. under an exclusive license from Flowtron covering Flowtron's patented technology. Information from the meter, when processed through the Fuel Log read-outs, enables marine operators to quickly determine maximum engine efficiency at any given moment, weather, sea condition, and on-board weight. Operators can then instantly adjust engine rpm and tank flow to yield maximum power using the least amount of fuel. Fuel Log systems come in three sizes, for engines that consume up to 40, up to 360, or more than 360 gallons per hour, and are priced from $3,500 to $14,500, including installation and operator training. DETROIT DIESEL Circle 73 on Reader Service Card The Detroit Diesel Allison division of General Motors offers advanced fuel economy models of its 149 Series diesel engines. The turbocharged and intercooled engines are said to be the most fuel-efficient heavy-duty diesels available in their power range. ELECTRO-MOTIVE DIVISION Circle 74 on Reader Service Card A new, more fuel-efficient version of the popular 645 Series diesel engine was introduced in 1983 by the Electro-Motive Division of General Motors. Compared with previous 645 models, the new engine is said to provide a reduction in fuel consumption of about 3 percent. The new EC engine series combines innovative design features that insure superior performance, extended operating service, and enable the engine to withstand higher operating pressures with state-of-the-art turbocharger technology. The 645EC uses a 16:1 compression ratio piston, increased from 14.5:1, producing the same power output with less fuel. A newly designed impeller and compressor have been incorporated into the turbocharger. FLEET MANAGEMENT SYSTEMS GROUP Circle 51 on Reader Service Card The Vessel Management System (VMS) has been designed by Fleet Management Systems to provide the operator with the information required to maximize vessel profitability. The functional, display, and analytical capabilities of the VMS are combined to support fuel management, engine diagnostics, and maintenance management programs, custom designed for any particular business operation. The VMS fuel management package collects engine and vessel operating data to build a speedpower curve for the vessel under actual operating conditions. From this, the VMS can recommend the optimal speed for minimum fuel consumption. FOSTER WHEELER Circle 50 on Reader Service Card In this ever-changing world of ours, flexibility, availability, and economics are paramount to survival in the business world. Foster Wheeler Boiler Corporation proposes that in the marine trade, the above three elements are available when you take advantage of "Fuels of Opportunity." To have to purchase a specific quality fuel or shut down your plant leaves you at the mercy of local and world conditions. To be able to buy "Fuels of Opportunity" leaves you able to apply the three elements of survival. GMT Circle 75 on Reader Service Card GMT of America Corporation has been formed as a subsidiary of Grandi Motori Trieste S.p.A. of Italy to promote and market GMT engines in the U.S. Besides commercial marine diesels, GMT is also a leading designer and builder of naval engines. GENERAL ELECTRIC Circle 70 on Reader Service Card While General Electric Company produces test data on burning low-grade alternative fuels in its diesel engines, it is producing electricity for use in its factory in Erie, Pa.—a new wrinkle for cogeneration. Three 16-cylinder GE7FD engines, each rated at 3,400 bhp, are run an average of 14 hours a day, five days a week, at 10 percent over their rating. Each engine is connected directly to a 3,000-kw generator that gives it a load to work against, and which produces the electric power. The engine test facility, which cost $3.9 million, is contained in a 6,000-square-foot addition to the powerhouse building. The primary function of the new facility is to evaluate performance of newly developed engine components through life tests. These tests will be conducted in parallel with GE's continuing search for more economical fuels. And as fuel costs also have a major impact on engine testing, the powerhouse project has been developed to recover some or all of those costs. GEORGE ENGINE Circle 69 on Reader Service Card As much as an 11.5-percent reduction in fuel consumption can be realized by George Engine Company's "bypass operation"—the upgrading of a Detroit Diesel 149 series engine from its normally aspired (NA) configuration to a turbocharged, intercooled, blower-bypass (TIB) configuration using the latest high-tech components from Detroit Diesel. Fuel savings provide a rapid payback of the cost of the conversion. The blower-bypass is a simple butterfly valve arrangement that automatically diverts the incoming combustion air around the Roots blower when turbocharger boost has reached a sufficient level. With the Roots blower bypassed, it no longer imposes an accessory load on the engine; the horsepower that was previously required is now available at the flywheel to do useful work. HITACHI ZOSEN Circle 68 on Reader Service Card In response to what it sees as the need for an integrated approach to saving energy, Hitachi Zosen has performed comprehensive research toward the realization of more fuel-efficient ships. As a result, Hitachi now offers an integrated energy-saving package consisting of four independent systems: improvement of hull performance; improvement of main propulsion plant; application of efficient measures for the machinery plant; and optimization of navigation and maneuverability features. These systems may be applied independently, in combination, or as an integrated, total energy-saving system. Among the items that may be included in the Hitachi package are the HZ bulbous bow; self-polishing type coatings; low-rpm, large-size propeller mounted in HZ nozzle; superlong- stroke, low-speed main engine; shaft generator; and 2- or 3- stage, pressure-type exhaust gas economizer. KHD Circle 76 on Reader Service Card A range of weight- and cost-saving diesel engines has been developed by Deutz Engines Ltd., British subsidiary of Klockner- Humboldt-Deutz AG, in which new technology has made them safely operable well within Zone 2 minimum requirements, without the need for purge-pressurized enclosures. Until recently, only a few small diesels have ever been adapted to operate free-standing in a Zone 2 environment, and these were extensively customized to suit particular applications. With this latest KHD development, it is now possible for Deutz 816 diesel engines in a variety of sizes and configurations with outputs ranging from 120 to 870 kw (163 to 1,180 bhp) to be operated safely in areas outside the protection of specially designed, purge-pressurized enclosures. The Deutz 816 series is available as a package adapted for Zone 2, which calls for a maximum surface and gas temperature of 250 C.
Deutz has gone beyond this requirement, with a maximum temperature of 180 C.
In adapting the 816, Deutz started out with certain advantages. The engine was developed originally for mining applications and meets strict West German regulations. The temperature of most of the engine surface was already well below the Zone 2 requirement, the problem of cooling being limited to the exhaust system. Even in this respect some of the work had already been done, as the 816 had an option of watercooled exhaust manifolds and turbochargers. KRUPP MaK DIESEL Circle 67 on Reader Service Card According to MaK, there are different ways to improve the total economy of a vessel's propulsion plant. Items that can be fully influenced by the engine maker are: reduce the specific fuel consumption; design the engines for the lowest grades of heavy fuels that will be available in the future; and provide heavy-fuel engines for a wide output range in order to generate auxiliary power on board ships with engines using the same low-grade heavy fuels burned in the main propulsion diesels. M.A.N.-B&W DIESEL Circle 66 on Reader Service Card M.A.N.-B&W Diesel, as the world's largest designer of marine diesel engines, has successfully developed engines with the highest thermal efficiency available, while at the same time maintaining a very high level of service reliability. With the introduction of the MC low-speed series, M.A.N.-B&W has brought the fuel consumption down to 118 grams per brake horsepower- hour, which, compared with the 156 g/bhph 10 years ago, means a reduction of about 25 percent. At the same time the corresponding revolutions of the direct-coupled propeller have been reduced from 114 rpm to 60 rpm, which has led to an increase in the propeller efficiency of 12-15 percent. These factors combined mean a total saving in the fuel oil consumption on propulsion engines alone of up to 40 percent. MTU OF NORTH AMERICA Circle 77 on Reader Service Card MTU of North America, Inc., is the American subsidiary of Motoren- und Turbinen-Union Friedrichshafen GmbH (MTU) of West Germany, which is owned jointly by Daimler-Benz and M.A.N. The U.S. company has devoted more than five years to building a sales and service organization that reflects the high standards of the MTU organization worldwide. MWM-MURPHY Circle 98 on Reader Service Card In early 1983 Motoren-Werke Mannheim A.G. (MWM) announced an expansion of its U.S. The 400 series is a four-stroke, direct-injection design available in diesel oil, natural gas, dual fuel, intermediate, and heavy fuel versions. There are three basic model classifications in the 400 series— the 440, the 441, and the newest 444. The 440 and 441 models have the same 9.06-inch bore, 10.6-inch stroke, and swept volume of 684 cubic inches per cylinder. The new 444 model has the same bore but the stroke has been increased to 12.6 inches, giving a displacement of 812 cubic inches per cylinder. The longer-stroke 444 is available in in-line 6- and 8-cylinder turbocharged-intercooled models, and has an operating speed up to 750 rpm. It was designed for optimum performance on lower grade and heavy fuels up to 3,500 sec. Redwood 1, which may be the norm in years to come. Redesign of the internal cooling circuit and new generation turbochargers has increased the overall efficiency of the basic engine design, producing an output significantly greater than 440 model with no detrimental effects on fuel consumption. For the introductory model 444, output on diesel fuel was 250 bhp per cylinder at 750 rpm—2,000 bhp for the 8-cylinder model. The 501 model is available in a turbocharged-intercooled in-line version with six or eight cylinders. Each has a bore of 14.2 inches and stroke of 17.7 inches; operating speed is between 428 and 514 rpm. Designed for operation on diesel and poorer grades of fuel, output at 514 rpm is 2,475 bhp for the 6- cylinder model and 3,300 bhp for the 8-cylinder version. ONAN Circle 91 on Reader Service Card The Onan Corporation of Minneapolis recently introduced the L317D-M and the L423D-M marine propulsion engines. With ratings of 43.5 bhp and 60 bhp at 3,600 rpm, and weights of 475 and 549 pounds, respectively, the latest Onan engines are part of a family that will eventually offer models with ratings up to 150 bhp. With a weight-to-horsepower ratio of about 11:1, the four-cycle L317D-M engine has a displacement of 105 cubic inches. The L423D-M has a weight-to-horsepower ratio of about 9:1 with displacement of 140 cubic inches. Both models have a common 3.5- inch bore and 3.62-inch stroke. Onan has been a well-known supplier of marine machinery for more than 25 years. This experience has resulted in a number of features and options on the propulsion engines, including a marine cooling system, marine gear, marine alternator, and special mounting system. OOSTERHUIS INDUSTRIES (MITSUBISHI) Circle 65 on Reader Service Card Oosterhuis Industries, Inc., marine engine distributor for Mitsubishi Heavy Industries America, Inc., has been marketing heavy fuel burning diesel engines for more than 20 years. Based on that long experience, the Oosterhuis firm feels that in the lower horsepower ranges and for inland vessels, blended fuel could be a better choice than heavy fuel oil. The SU-MTK is available for propulsion applications from 1,500 to 3,000 bhp at 1,200 rpm, and operates on a blend of 30 percent marine diesel oil and 70 percent heavy oil. Oosterhuis offers a blending unit that blends the proper quantities while taking fuel on board, making separate storage tanks and heating coils unnecessary. When operating on blended fuel, a fuel oil separator is required, and depending on lube oil capacity, a lube oil separator is recommended. PANDEL INSTRUMENTS Circle 64 on Reader Service Card A computer-based fuel management system, the FMS-3, was introduced recently by Pandel Instruments, Inc. The . system compares the fuel burned versus the speed made for vessels in the 4,000-bhp range and up. It consists of two major components: flow and temperature sensing devices, and the main computer unit with the system display. The FMS-3 monitors individual engine burns and vessel speed, and the computer calculates the fuel burned per mile of operation. Performance charts for the individual vessel may then be constructed to allow operation at known efficiency levels. The system is configured to function with marine diesel engines using lowpressure fuel supply pumps and return fuel circuits. It has hardware and software correction factors for fuel heating during recycling; aeration of the return fuel, and flowmeter calibration. PENSKE G M POWER Circle 63 on Reader Service Card Penske GM Power, Inc. represents Detroit Diesel Allison and Electro-Motive Division products that have survived the test of time and consistently provided the kind of value and dependability that produces results. The company is authorized to carry all Detroit Diesel engines and also offers the EMD 645 Series. The Penske-engineered Detroit Diesel 8V92TI, a high-performance marine power package, is a compact, heavy-duty engine with a horsepower-to-weight ratio of 6.4 pounds per shp, establishing a new standard for the industry. The 8V-92TI marine propulsion engine was developed using only field-proven components and thoroughly tested by Penske's own dynamometer. SACM Circle 92 on Reader Service Card SACM (Societe Alsacienne de Constructions Mecaniques) of France manufactures medium- and high-speed, four-stroke, direct injection diesel engines known for their lower specific fuel consumption and compact size. The company is represented in the U.S. by F.W. Donnelly Company of Houston. SACM engines ranging from 100 to 8,400 bhp are in use throughout the world in a variety of commercial and military high-speed vessels. These include the Bell-Halter BH 110 surface effect ship, the Westamarin catamaran, and SAR 33. SEAWORTHY SYSTEMS Circle 62 on Reader Service Card Seaworthy Systems, Inc. (formerly Seaworthy Engine Systems, Inc.) has prepared more than 100 energy audits on all types of vessels, many of which are older steamships operating in vastly different operating modes than their original design. In performing such audits, Seaworthy has found that many such vessels, because of their machinery and cycle arrangements, are operating at rates well off their economic optimum for present-day operating conditions. As a result of these observations, some operators have reviewed their operations and performed, or had performed, detailed technical and economic evaluations of machinery and cycle arrangements. In addition, some have also evaluated present fuel systems, auxiliary components, and operational profiles to identify and rank various options and modifications for improving and/or restoring the thermal and combustion efficiency. The average steamship is operating with a fuel bill of $3-6 million per year. A savings of 3 to 7 percent is often obtainable from the application of certain modifications. It is generally understood that the less costly modifications will give the quickest paybacks, with others becoming economically attractive if extended operating life is projected. SULZER Circle 60 on Reader Sen/ice Card The end of 1983 saw the commissioning of the first Sulzer RTA superlongstroke engines to be used for steam-to-diesel machinery conversions. Both the 1,813-TEU cellular containership Remuera Bay of Overseas Containers Ltd., and C.Y. Tung's 2,300-TEU Oriental Educator have each been equipped with a 9-cylinder RTA76 engine resulting in considerable fuel cost savings. Sulzer low-speed diesel engines have already taken a major role in the wave of steam-to-diesel conversions of recent years. The large, fast containerships built in the early 1970s with powerful steam turbine plants had proved particularly vulnerable to the high fuel price levels of the past decade. After initially slow-steaming, many were re-engined with more fuel-efficient diesel machinery. For example, 10 ships trading between Europe and the Far East were each repowered with twin 8RND90 diesels, reducing their fuel costs by some 30 percent. SW DIESEL GULF (STORK WERKSPOOR) Circle 6 1 on Reader Service Card SW Diesel Gulf, Inc. specializes in heavy-duty, heavy fuel engines in the power range from 1,000 to 20,000 bhp; all are of the 4-stroke type. The engines have been designed to use low-grade fuel and can be operated reliably on highviscosity fuel containing 5 percent sulphur and 500 ppm vanadium. This is possible because of the many special, heavy fuel features, such as deep-cooled valve seats to avoid hot corrosion by vanadium pentoxide/sodium compounds. Because of long inspection intervals, maintenance costs are low when burning heavy fuel and are further reduced by the use of special hydraulic tools to loosen and tighten the nuts of important engine parts such as cylinder heads, main bearings, and big end bearings. The use of these tools makes torque wrenches superfluous, and makes life for the crew and maintenance people a lot easier. TRANSAMERICA DELAVAL Circle 59 on Reader Service Card The dramatic changes in marine power favoring slower-speed diesel engines offering more efficient operation on less expensive, heavy fuels presented technical criteria not at all new to Transamerica Delaval's Engine and Compressor Division. Unlike many of the foreign- built diesels whose "degraded fuel" experience is largely with straight-run residuals, Transamerica's Enterprise medium-speed engines have been burning a considerably lower quality, heavily cracked residual type oils for years. The company's R4 diesels (450 rpm), and its recently introduced R5 units (514 rpm), have been evolved over the years with combustion systems that have the proper materials, systems techniques, and intensive cooling configurations to obtain the most efficient use of heavy fuels with minimum maintenance penalty. For example, cylinder heads are cast steel, providing the strength for the use of thin sections in critical areas to control thermal distortions. The Enterprise four-valve head is designed for maximum air and exhaust flow efficiency. Steel piston crowns with nodular iron skirts permit thinner walls between the combustion chamber and "cocktail shaker" action of the cooling oil for reduced thermal stresses. Compression rings are chrome plated and specially profiled for long life on residual fuel. Recent evolutionary developments that led to the Enterprise R5 diesel (mcr range, 3,600 to 12,200 bhp) have brought the company's medium-speed family 40 percent more horsepower per cylinder and per square foot of installation space; the latest in heavy fuel efficiency; 3.5 percent lower specific fuel consumption; and the versatility afloat that often gives the medium-speed unit a net operating cost advantage over its competitors. VOLVO PENTA Circle 93 on Reader Service Card Volvo Penta offers a marine version, the TMD 120, of its 12-liter diesel engine. Specifically designed for use as the main propulsion engine in workboats and other craft, it is said to have high output in relation to weight and installed dimensions, low fuel consumption, and a high level of reliability. The B version of the TMD 120 features advanced control of the injection and combustion processes, with new injectors that provide more rapid injection at higher pressure, and with decreased combustion delay. Together with efficient turbocharging and a combustion chamber of a new design, these features are said to yield considerable improvement in efficiency. The Swedish company's diesel line includes 2-, 3-, 4-, and 6-cylinder engines covering 12 different models; some are equipped with turbochargers and others with both turbochargers and aftercoolers. Additionally, Volvo offers twin engines driving through a single compound gear, providing a single shaft output from 336 to 580 shp. This twin-engine/single-output package provides many advantages, including "take-home" capability on one engine. WARTSILA DIESEL Circle 94 on Reader Service Card Wartsila Diesel, one of the world's leading manufacturers of medium-speed diesel engines, has three production plants: the Wartsila Vasa factory in Finland, the Trollhattan factory in Sweden, and the recently opened Wartsila Power Singapore in Singapore. WAUKESHA Circle 78 on Reader Service Card Waukesha Engine Division's AT25 Series 250-mm bore, medium- speed diesels operate economically and efficiently on heavy fuels. These high-output engines, built under a license agreement with Sulzer Bros. Ltd., are available in 6- and 8-cylinder in-line and 12- and 16-cylinder V models with a power range from 1,260 to 4,800 bhp (941 to 3,581 kw) at 720 to 1,000 rpm. Enginator® electric generating systems are rated to 3,040 kw, 60 Hz at 900 rpm. Features for ease of maintenance include quick-access covers for camshafts and main bearings, and a provision for quick removal of rocker arm covers for valve adjustments. Water, lube oil, and fuel transfer pumps are located on the front of the engine for ease in maintenance. Hydraulic tensioning of main bearing studs and connecting rod studs is accomplished with specially designed tools to insure accurate loading of these critical joints. WESTINGHOUSE Circle 95 on Reader Service Card Combustion trim control systems manufactured by Westinghouse Electric's Combustion Control Division are saving $168 a day in fuel costs aboard Moore McCormack Bulk Transport's 39,232-dwt tanker Mormacsun. The systems aboard the Mormacsun have consistently controlled the excess oxygen at levels ranging from 2.5 to 3 percent, a reduction of at least 1 percent from previous operation. Mormac engineers believe a 1-percent reduction of excess oxygen produces fuel savings of at least three barrels of oil per day in each boiler. Based on these calculations, Moore McCormack achieved a payback on the equipment alone in about eight months. Including the cost of installation, the payback on the total package was about 15 months.